The most common species of rabbit in Arizona is the desert cottontail. They are especially plentiful in years have average abundant winter precipitation. While these garden visitors can be cute and fun to watch, they can also be destructive to tender annuals, vegetables, and newly planted trees and shrubs. There are several methods that can be employed to minimize the effects of cottontail rabbits on your favorite garden plants. Typically, cottontails live only 12 to 15 months in the wild and it is rare for them to live longer than two full years. According to the Arizona Game and Fish Department, desert cottontails may have up to five litters of two to four young per year. However, this reproductive potential is rarely reached due to predation and other environmental factors. The young leave the nest two to three weeks after birth. Cottontail rabbits generally spend their entire lives in an area of 10 acres or less, so if there is suitable habitat within this distance, you are likely to encounter rabbits. During cold weather, they use natural cavities and burrows of other animal for their dens. Otherwise, rabbits seek cover and protection in brush piles, brushy hedgerows, debris filled gullies, and landscaped backyards with suitable cover. Cottontails rarely drink, and free water does not appear to be a requirement for either their survival or reproduction. However, moist areas act as an attractant because of succulent vegetation. Removal and/or modification of these features will change the area's suitability as cottontail habitat. With any garden “pest”, damage must be correctly identified before control efforts can be effective. Often, cottontails are observed feeding and frolicking which makes identification much simpler. In general, cottontails eat vegetables and flowers in spring and summer and cause damage to the lower potions of woody plants in fall and winter. Rabbit damage appears as cleanly clipped stems on tender shoots and small, chiseled, gnaw marks on woody plants. Cottontails seem to prefer plants in the rose family: apples, raspberries, blackberries, etc. Vegetables and many annual flowers are also favorites. Conversely, corn, squash, tomatoes, potatoes and some peppers are rarely bothered. These general feeding guidelines are often negated in times of drought and when food options are limited. The best way to prevent rabbit damage is to simply exclude them. This can be most effectively done with a three foot-tall chicken wire fence stretched tight and buried six inches in the soil. Chicken wire should have holes one inch or smaller. To protect young trees, use cylinders of ¼" wire hardware cloth (heavy duty galvanized wire screen) wrapped around the tree trunk. It should be spaced one or two inches away from the trunk, cover the area that can be damaged, and be tall enough to extend beyond a cottontail's reach (20+ inches). In vegetable gardens, floating row cover can be used to protect young plants. In flower beds, chicken wire cages can be built to exclude rabbits. Repellents are also available. These compounds either render the plant parts distasteful or smell bad to rabbits. Commercially available repellents may be locally available, but can be also be mail ordered. Hot pepper wax is often used as a taste repellent, but new growth will not be protected unless a coated with a new application. “Home remedy” repellents such as human hair and perfumed soaps are usually not effective. A relatively new repellent product called Plantskydd Deer Repellent contains blood meal combined with a vegetable oil binder. This organic product was developed in Sweden’s commercial forests and is effective in repelling deer, elk, and cottontail rabbits. It is available in some nurseries and garden centers, but can also be ordered on-line direct from the manufacturer. Habitat modification and exclusion are the most effective strategies against cottontail damage. Repellents are a useful tool where other strategies are not practical. Shooting is not usually an option as cottontails are a game species and firearms use is restricted in urban and suburban areas. Otherwise, selection of resistant plant species and tolerating some plant damage should lower your gardening stress level. 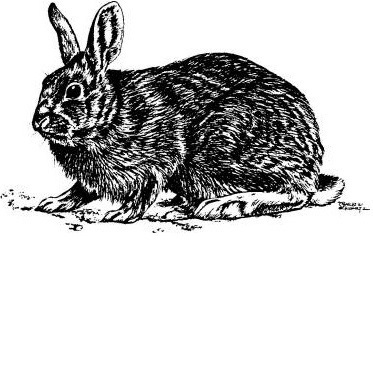 For a list of rabbit resistant plants, download the publication: Deer and Rabbit Resistant Plants at http://ag.arizona.edu/pubs/garden/az1237.pdf. Naming of companies or products is neither meant to imply endorsement by the author nor criticism of similar companies or products not mentioned. Follow the Backyard Gardener on Twitter – use the link on the BYG website. If you have other gardening questions, call the Master Gardener help line in the Camp Verde office at 928-554-8999 Ext. 3 or e-mail us at cottonwoodmg@yahoo.com and be sure to include your name, address and phone number. Find past Backyard Gardener columns or provide feedback at the Backyard Gardener web site: http://cals.arizona.edu/yavapai/anr/hort/byg/.